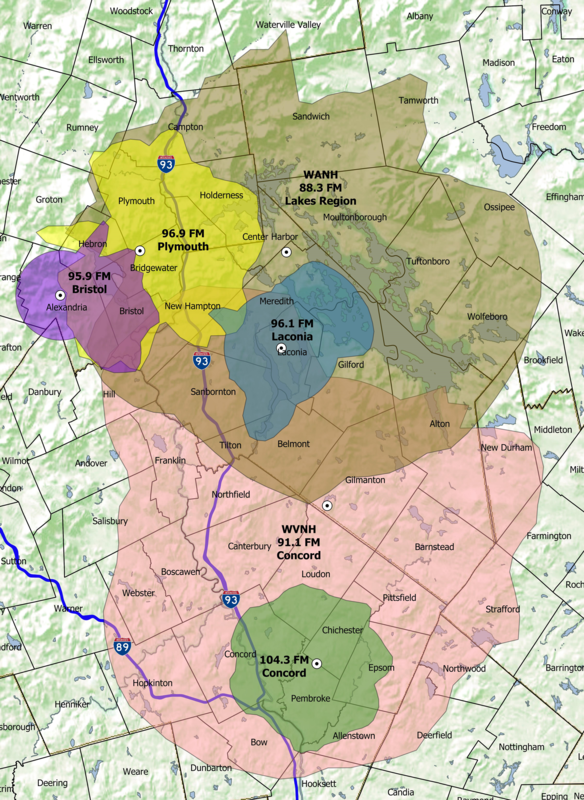 WVNH 91.1FM provides coverage of an area of Central New Hampshire that includes Manchester to the south, Laconia to the north, Hopkinton to the west and Northwood to the east. The coverage area of the new WANH 88.3FM signal extends to all the towns surrounding Lake Winnepesaukee. The W241AJ 96.1 signal translator covers downtown Laconia and it’s surrounding area. The W245AF 96.9 signal covers the Ashland/Plymouth area. The W282AF 104.3 signal covers the Greater Concord area. The W240CS 95.9 signal covers the Bristol area.